This article explains Performance Planning in a practical way. After reading it, you will understand the basics of this powerful employee development and stress management tool. Performance Planning is a systematic and structured approach used to assess the performance of a team, department or individual employee throughout the year and to see whether the desired goals have been successfully achieved. This makes Performance Planning a crucial part of the employees’ career development. It can be used and applied in any situation and at any level within organisations. In addition to the individual performance management of employees, this approach also focuses on talent management of individuals as well as on the entire organisational development. Performance Planning is about providing a clear, structured process to achieve a certain level of performance. Performance planning sets targets in advance, which are then used in the final assessment. Performance Planning has a chance of succeeding only if the personal goals and/ or department goals of the team are set up in the right way and set up in accordance with SMART. This means that the goals not only have to be specific (entailing what exactly has to be achieved), but also measurable and transparent (including the starting point and the point at which the goal has been achieved). This can also be set in a timeline. In most cases, targets in performance planning apply for a one-year period. In addition, the objective must be both acceptable and realistic to implement. A goal that’s attractive to a manager, but one which employees will reluctantly implement, is totally unacceptable. The more acceptable the objective, the more motivated the individual employee or team is to achieve it. As a result, it is important that there is clarity and agreement concerning the objectives being pursued. This is the only way to establish cooperation between employees and managers. The end result, as such, will be to everyone’s satisfaction. In addition to setting clear goals, one is also advised to properly discuss the performance factors and relevant expectations with the individual employee or the team in advance. The objective formulated earlier in SMART can help in this respect, as well as having a discussion together and seeking agreement with the company objectives. The individual performance plan can thus be better documented and the employees know what is required of them and what they are judged on at the end of the road. The list of performance factors is clear and specific for each individual employee, depending on his/her job, tasks and specialisation. To arrive at a good evaluation, one is advised to not only look at the performance plan of previous years, but also at the final evaluations from the past. Based on these data, a fair judgement can then be made about the current employee performance. First and foremost, performance planning is a great way to convey basic responsibilities to employees. This way, they’ll be able to understand better why they had been hired and what might be expected of their function within a year. In addition, the objectives regarding the goals are clear, not only for the individual, but also for the team. As a result, employees will feel more involved in the department, but also in their colleagues’ work. They know what is expected from them. As a result, they’ll be more motivated to work on their own competency, which will ultimately have a positive effect on their productivity. What challenges you most in your current work? Which task within your current function gives you the most energy? Are you experiencing certain obstacles in your current position? What kind of recognition do you receive for your performance? What kind of recognition do you receive when you successfully complete a project? Are there any new things you would like to learn? What do you think about the support of your department? In what ways is support from your manager lacking? Which goals does the team have to achieve within a year? Which new goals should be added? Which priorities play a role within the team? What kind of expertise is missing within the team? Which performance areas are going well at the moment? Which performance areas fall short and need to be improved? How can these improvements best be implemented? Performance Planning must be effective in monitoring and measuring results. To properly implement Performance Planning in an organisation, a step-by-step plan can be used, in which the first preparations are made. Then performance levels can be identified and made measurable. In addition, the drawn-up Performance Plan can also be useful when recruiting and selecting new employees or for setting up various training programmes for staff. First of all, in order to get started, data must be collected. Which components will play an important role in the Performance Planning, based on which objectives? The job descriptions of the employees also provide important information, so that they can then be evaluated on this basis. In consultation with the Human Resources department, a form can be developed that serves as a template for the expected order results. Now the work can really begin. Together with the employees, the goals are set, based on their work and their job description. It’s the job of the manager to update each individual employee and discuss the overall performance process with them. The performance target is then set down on paper and the first planning sessions are put on the agenda in consultation with the Human Resources Department. Discussions with employees commence; their performance and whether they have achieved their objectives will be assessed. Continuity is assessed based on previous years. Where striking differences come to light, this is discussed with the employee. The reasons thereof are looked at together, and adjustments and/or improvements are discussed. Everything that’s discussed is written down. New agreements will also be put to paper. Each organisation can give its own interpretation in order to better personalise the Performance Plan. In any case, it is advisable to include the joint objectives in the form. It must also reflect the various performance factors, as well as the fact that these differ per employee. Only in this way can Performance Planning work as a motivation tool for employees. What do you think? Are you familiar with Performance Planning? Do you recognize the practical explanation or do you have more suggestions? 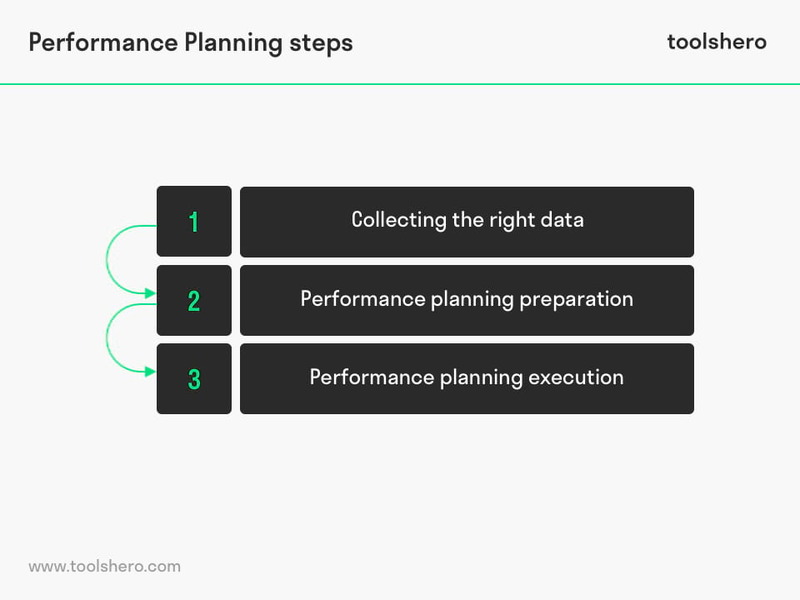 What are your success factors on Performance Planning that you would like the share with the ToolsHero audience? King, P. (1984). Performance planning & appraisal: a how-to book for managers. McGraw-Hill Companies. Rudman, R. (2004). Performance planning and review: Making employee appraisals work. Allen & Unwin Academic.